Good morning. I'm back from vacation and hoping that just maybe things are getting back to normal. Last night I was playing with paper and checking in on my favorite blog sites (ah, multi-tasking). I should add I was also watching my San Francisco Giants playing ball! 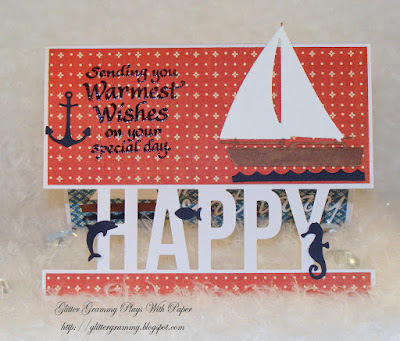 Anyway, When I checked in on the Poppystamps blog page I saw the August Challenge #11 - The Heat Is On. Well guess what, I was working on this birthday card. Well, summer + heat = playing in the water. I'm going to enter my little card into the challenge! And.....wait for it.....this card was made with scraps. Yup, before I went on vacation I was making thank you cards for the people we stayed with. These are pieces of Graphic45 papers that were left over. Well, the sailboat was cut from white scraps that I colored with my Spectrum Noir pens. I haven't been here in awhile and I do hope Di at Pixie's Crafty Workshop doesn't think I forgot about the playground gang, because they've never been far from my blogland hopping. I've been having fun playing with my dies and you can never have too many on a card...Right? And here is what the inside of my little card looks like. Last night I pretty much cleaned up my mess, but here's a picture of my little family room desk and it isn't looking too bad! I've got my coffee, my iPad, a new die I've not tried yet, my notebooks that I jot down ideas, water (because I'm trying to drink more) and under the desk dog toys. So that's what I have on my desk this morning. I'll head on over to show off my cleanish desk. How about posting your desk on What's On Your Workdesk Wednesday? I'm off to teach a class today. I guess I should get my act together and head out the door. Until next time, and I hope to be posting more. I admit, I've been a bit absent. Wait! .....can I add one vacation photo? My granddaughter and I spent time paper crafting. I brought an album filled with lots of fancy cutting. And there was a lot of paper to do more. She isn't quite 10, but she caught on quickly and did a great job. Then we put an "I Am" album together. I assembled the base from a kit I bought at Paradise Scrapbook Boutique. Bridget cut all the papers for the album and she decorated it all by herself! I am one proud grammy! Angela, I tried commenting and then realized I needed to join your community to do so. I want you to know your card is really nice. I love square format cards and yours is really nice. Thanks for your kind comment. Hi Mary . . . glad you had a great vacation and your granddaughter is clearly going to be a great crafter! Love your two sailing cards. OH Mary!! What a wonderful post! 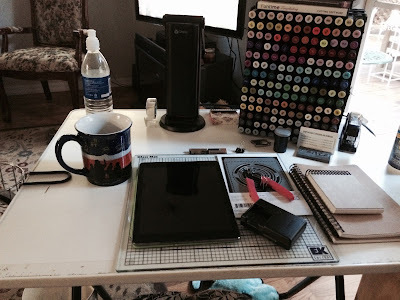 I loved seeing the pic of your desk and the beautiful project you made to share. The front cut out like a window on the happy is amazing.. and your desk? Well it's too stinkin clean for me !!! LOL!!!! But you stole my heart and the show with that pic of you and your grand daughter. You made me smile inside and out! I would love a little friend to share my hobby with!! You are blessed my dear friend!! That is a beautiful card, Mary! It should always be kept on a desktop and never be hidden! 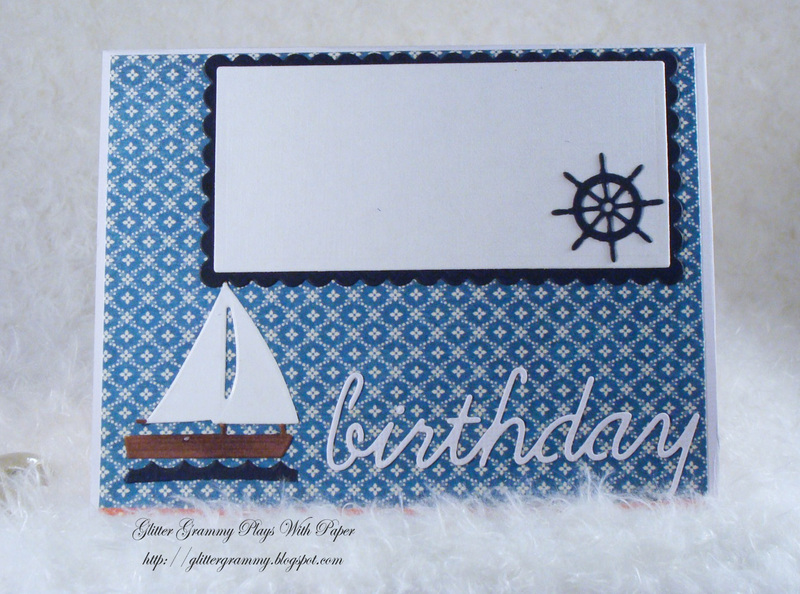 Love your nautical themed cards! Mary, this is an adorable nautical themed card! 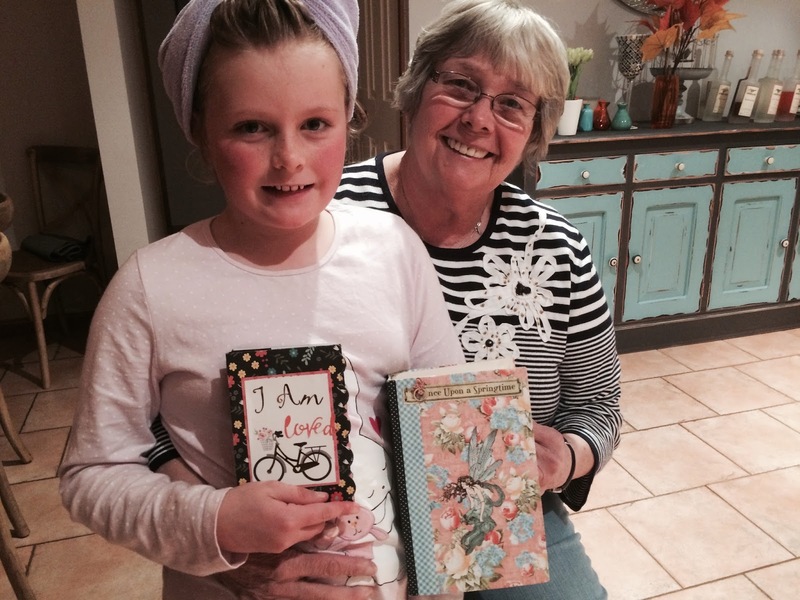 It's so nice to see you sharing your crafty passion with the future generation! Will we see a Glitter Grand daughter soon? Thanks for playing along with the Heat is On Challenge! Thanks for playing along with us at Poppystamps this month! This is an amazing card, Mary! I love the cut out front! Hot summer weather calls for water! Great fun with your granddaughter! What a fabulous masculine card and I love your use of the acetate!